In 2011 and 2013, Sparkle made some New Year’s resolutions for her human. I was going to carry on this tradition for 2015, but Binga just told me that Sparkle gave her the job of doing New Year’s resolutions. I don’t know if I believe her. Do you? Anyhow, I figured I had better let her do it. You know how torties get when you try to tell them no. Oh, and she says the resolutions are for everybody in the house. Except for herself. 1. From now on, I get treats before and after the dog gets walked, not just after. But just me, not the pipsqueak. 2. If my human is late getting up to feed me, I am allowed to bite her on the nose as punishment. 3. Boodie must let me taste her food, even if it’s same food as I have in my dish and I haven’t finished my dinner. 4. No more late dinners! Feed me promptly at 6 PM. Oh, and I guess the other cats too. 5. All new catnip toys must be given to me to pass my inspection first, and I decide if any other cat gets to play with them. 6. 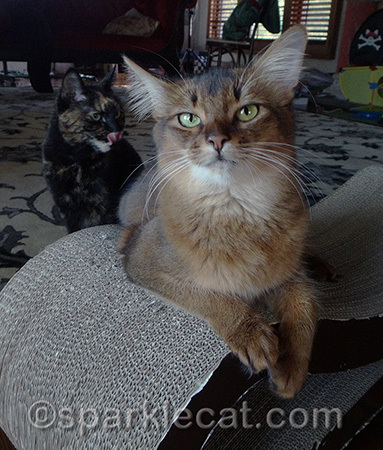 If the pipsqueak is doing a photo session, I am allowed to interrupt it, and no griping from her or the photographer. 7. I can do anything I want, so everyone had better stop complaining. I’m not so sure these are in the real spirit of New Year’s resolutions. But whatever. She has the Tortitude to prove it! resolutions with tortitude…we like it 😀 Plus it is way more fun to make resolutions for somebuddy else, hee hee! Binga knows what she wants! I’m not so sure about the pipsqueak part-you look very grown-up in the first picture! Sparkle would be proud. Binga knows what she wants. Happy New Year. We live you resolutions, Binga! The Mom didn’t help us do too much blog prowling on Christmas cause her broken toe hurt too much for walking on the internets…. 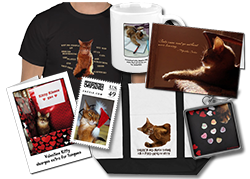 so we am furry glad you had a very Happy Christmas and purring for a furry Happy Mew Year!!! plus Molly and Happy who are looking for their furever home. 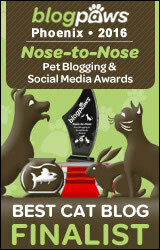 Wow, Binga has moxie! I think she has a chance with #3 and 6. Well, um, those DO sound Binga-esque, but we aren’t sure we believe Sparkle passed that job to Binga, either! Happy New Year, dear friends. Here’s to a 2015 full of love, health and happiness. Who said Binga is dictator? Harumph! 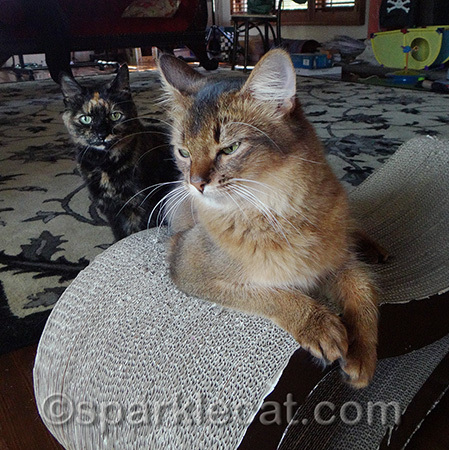 The resident Tortie here is learning quite a bit about Tortietude from Binga. Not sure that’s a good thing! We both like Binga’s resolutions though! Pretty much what I’d expect from a tortie, although it was pretty nice of her to say you could all eat at 6 pm , not just her. Happy and healthy New Year to you all. Hope you have a Happy and Healthy New Year!!!. Nice try Binga. I don’t think you’ll get away with those resolutions. Maybe a few, but not all. Oh Binga! You are incorrigable!! So I guess we must incorridge you the!! MOL Happy New Year! Binga – Yous makes mes laugh! Wes wishing yous all a Healthy, Happy and Prosperous New Year!!! Those are all good revolutions especially #2. Iâ€™m all about biting. Happy New Year to everyone from La Casa Keisha! Here’s to a wonderful, healthy and prosperous 2015 filled with great food, love & cat adoptions. Binga, why not ask for dinner earlier than 6pm. I like to ask for mine a 4 pm. Happy Happy brand new year! Wishing you only good things in the New Year. Those work for us!! HAPPY HAPPY NEW YEAR! May 2015 be MUCH kinder to so many of us than 2014 was! 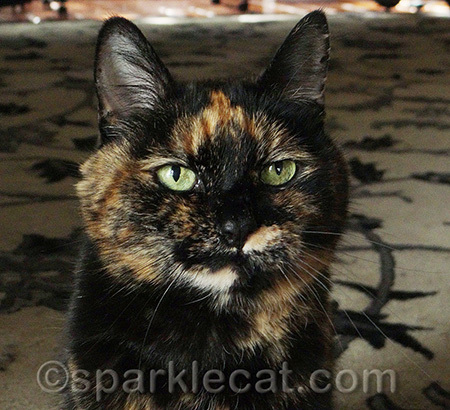 Tortie New Year’s resolutions – I love it. Allegra and Ruby applaud Binga. Happy New Year to all of you! We’ll be keeping track during the year to see how many of those get broken. Summer, we feel your pain. Just remember that with Torties…age and treachery will always overcome youth and skill. But also remember in the Somali breed profile it states that we are “willful, stubborn, and obstinate”…even our very own Teddy Monster will acquiesce to Serafina and he is twice her size! Binga had best be on her guard. Uh Oh, aLL three Torties here read these resolutions and we have written them down and going to implement immediately. Especially the last one. Happy and Healthy New Year to all of you. Those are some great resolutions, Binga, though we aren’t sure the other cats are going to go along with them. We do like the dinner promptly at 6pm resolution, though. Let’s figure out how to make that one stick! Happy new year to all of you (and your humans, too). Wishing you a very happy new year! I hope that 2015 is filled with only good things! Happy New Year! We hope 2015 is a healthy and happy one for you. I don’t really think that Sparkle gave this job to Binga ?! It looks like things aren’t going to change much in the new year, Summer. You got your paws full of Binga! 🙂 Happy New Year to you all! Well, I guess you can’t blame a girl for trying! Happy New Year dear friends from all of us at Brian’s Home! Well, at least those seem easier than exercising or losing weight. Happy New Year!!!! Uhhhhhh …. We don’t trust Binga. You & Boodie watch out!!!! We think #7 pretty much sums up tortie ‘tude.